Are you familiar with Young House Love? Until a couple of months ago I wasn't, but since then I've been enjoying following along with the lives and home decor projects of the young couple who are in love with one another and their new-to-them house. Utterly adorable, and engaging writers to boot, John and Sherry have managed to turn a blogging venture into full-time jobs. They spend their days doing things the rest of us might cram into weekends, photographing each step of the process, and then writing about it all in an appealing manner. You know me... always on the lookout for a reason to tell you about sites I enjoy. 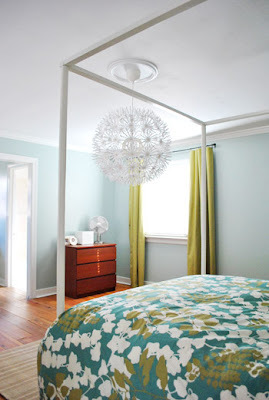 Needless to say I was thrilled when John regaled readers last week with the story of selecting, installing, and making peace with a pretty incredible light fixture for their bedroom ceiling. Guess what? It's made of paper! 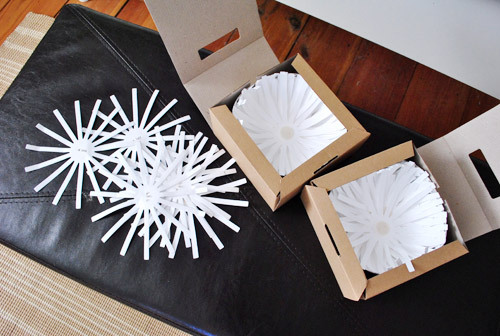 Lots and lots of fringed flowers come packed in little boxes so the petals will be curved in just the right shape on arrival - how smart of the folks at IKEA. Yes, IKEA! This is one cool paper project you don't have to make from scratch. Read more about the assembly and hanging of the lamp (actually much more... John and Sherry are all about details!) here. WOW really sharp, it would be hard to keep dust free, its Beautful though! Aw thanks so much for the link love! We're blushing over here. chillin... I know what you mean, things sure do get dusty. I think I'd just imagine it to be a big dandelion puff-ball and blow on it every now and then! Sherry, you are so welcome. Keep up the great work! Gorgeous Lamp! I thought for a second it was punched paper for even cut coffee filters... even better that it's already done by ikea! So pretty! what an idea! oh yes a great focal point; how pretty when the room is dark and the light is on. I see it as a huge dandelion flower too. Love the whole decor/colour in their room. Amazing web site. Thanks for sharing! Super cute, my favorite part is the fact that I have the very same duvet cover on my bed right now!!! I love that!! Thanks for this Ann. I myself am on a paper flower blitz this month. I think Spring is doing strange things to me...LOL! i know about this too but its too expensive!! 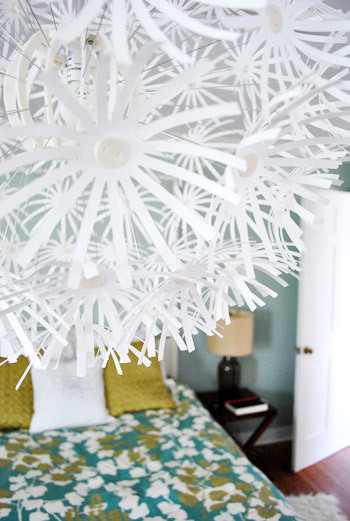 But i like the idea of using paper and turn this into a beautiful lamp.